A reader emailed me asking for advice on finding tires for an old travel trailer he had bought, and finding someone to help him get it home from where it is parked. Because he asked specifically for finding someone to help him get it home, I suggested a hauling company near his home who could move it for him (perhaps on a flatbed equipment trailer) with coverage by their insurance policy. But it gave me the idea for writing a few pointers describing how to get a trailer home that you are thinking about buying. I made two assumptions: the trailer is not currently registered and hasn't been moved in awhile, and you want to move it yourself. Here's how to approach the problem. First, check your local and state laws. You are looking for such things as: is the trailer too big to haul without a special permit? Do you have a grace period after purchase, during which time you can move it with just a bill of sale and/or registration slip signed over to you? In many places you have anywhere from 7 to perhaps 30 days before you have to have current tag and registration. Next, inspect the trailer. Hopefully, you do this before you strike a deal with the seller. Bring along a ball-peen hammer, large flat-blade screwdriver, and something like WD40, PB Blaster, or a squirt bottle of a mixture of automatic transmission fluid and kerosene. Spray that stuff on the trailer hitch, first. Take note of what kind of hitch coupling the trailer has. Chances are good that it is something standard, but it could be something off the wall that would cost money to adapt to your truck. Standard trailer couplings are not expensive, and it may be cheaper to replace than to accommodate an oddball coupling. Of course you're not going to try to replace a fifth-wheel coupling with a ball coupling, nor should you replace a 2 5/8" ball coupling on a large trailer with a 2" coupling in an attempt to save money. If the factory used a coupling with a high weight rating, there is a reason. Now look underneath at the frame rails. Use the hammer and screwdriver to probe, poke and prod. Pay special attention to obvious rusted areas. If you find rust holes in the frame, you may want to pass on this trailer. Just use your judgement. If you are getting a 1946 Spartan Imperial Mansion for $100, maybe it is worth repairing some frame damage, especially aft of the axles. Speaking of axles, that is what you want to look at next. Axles and everything connected to them, including wheels and tires. Make a note of the tire size. That was one of the questions the reader asked, in fact: how to find tires to fit his trailer. But don't automatically assume that the tires are obsolete just because your local tire shop doesn't carry them. Let's say, for example, that your trailer has 11-22.5 tires and the local tire guy responds with a blank stare or tells you nobody makes them anymore. Don't take his word for it. Go to a trailer equipment specialist and you will find that it is indeed a standard size, or that there is a standard replacement (in this case 275/80R 22.5). Once you have looked the trailer over and decided to buy it, talk with the seller. If possible, rather than doing a transfer immediately, see if the seller would be willing to accept a deposit and give you 30 days to prepare to move it, before legally transferring ownership. That gives you time to deal with any potential problems, and it insures that you are not wasting any registration grace period you may have for moving it. Once you get that out of the way, jack up one of the wheels. If the trailer has brakes and they are not on all axles, choose a wheel that has a brake. Block the axle securely (don't rely on just the jack) and remove the entire wheel and hub, including brake drum if there is one. To do this, don't take out the lug nuts or bolts. Instead, pop off the bearing cover with your screwdriver, remove the cotter pin from the spindle, and remove the spindle nut. Turn and pull the wheel until it slides off. Catch the outer bearing and pull off the inner bearing, put them in a plastic bag and bring them along. Before you go, stick a tape measure under there and measure the center-to-center distance between the spring pads. Go ahead and spray some of your rust buster on the U-bolts and their nuts, too. You may need to pull the axles, and letting your solvent work on the threads for a couple of days will make this much easier. Spray some on all the lug nuts or bolts too, including on the wheel you just took off. Now take the wheel assembly to your local trailer equipment supplier. Or do what I would do; take it home and put all the numbers and measurements (including bearing numbers, hub bore measurement, and bearing bore measurements) into an online search engine to see what they are and what fits. Chances are good that you will find a match. You should be able to determine the weight rating from the bearings; if not, the tires will have a weight rating listed on the side. You have already checked the availability of the tire size; now look for wheels (in the correct weight range, of course) that match the mounting hole pattern of your existing wheels. Even if it is an oddball size but your wheels and hubs are in good condition, you may want to keep them and try to find a couple of spares. Conversely, perhaps it would be better to replace your wheels and hubs with standardized parts and list your obsolete parts on a vintage trailer group website. You never know what a collector might be willing to pay for them. RV Basics has a list of suppliers of used RV parts; some of them would probably take your unwanted parts in trade for items you need. Brakes: even if the tire, wheel and bearing sizes are not a problem, that still leaves the brakes. While companies like Custom Friction can reline your original brake shoes or build new ones, if the brake drums are worn out it may not be economically feasible to repair or replace them. Of course nothing is impossible; contact Custom Friction or a similar company for a quote, if you really want to keep your original wheels. If you run into problems with any of the above, consider replacing the hubs and bearings with standard parts. Even if you were unable to find the bearing part numbers, go back to the trailer and use a caliper to measure the spindle diameter at the points where the inner and outer bearings sat. Make sure there is not a bearing race (looks like a sleeve) still on the spindle; if there is, you will need to remove it. The inner bearing mount surface may be larger in diameter, or the same size as the outer. Also measure the center-to-center distance of the mount surfaces. Once you have this information, go to a trailer parts supplier to find the parts you need. Eastern Marine is one example of an online supplier; their website lists bearings by inside diameter, weight rating and which hubs they fit. The chances are good that you can find a hub and bearing set that will allow you to keep the old axles while updating the wheels, tires, hubs and brakes to new, commonly available parts. As a last resort, the same parts suppliers can supply a whole new axle, or you can even buy them from Amazon.com. At a quick look, Amazon had a brand new 7,000 lb axle, complete with hubs and electric brakes, for less than $500 each at this writing. It accepts standard 8-lug wheels; the same ones your tow vehicle probably uses. If you only need 5,200 lb or smaller axles, or you don't need brakes on all axles, your costs will be less. Either way it is entirely possible that you could upgrade to brand-new, standard parts for less money and effort than trying to chase down usable replacements for your obsolete parts. I saw this on the Van Dwellers group. I think I've seen it before, somewhere else. Anyway, it's a worthwhile read. * Forgive your enemies. It messes up their heads. * Most of the stuff people worry about ain't never gonna happen, anyway. enjoy it a second time. 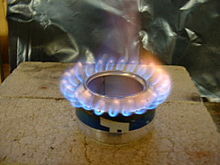 This is an article from Wikipedia describing the function and design of the diy Trangia-style alcohol stove that is commonly made from aluminum drink cans. I have seen these designs all over the 'Net, and have built a few of them myself. Most of the articles I have seen simply give step-by-step instructions for building a stove. This article doesn't give building instructions; it rather explains how and why the design works, and compares different versions of the stove. A beverage-can (or pop-can) stove is a homemade, ultralight portable stove. The simple design is made entirely from aluminium cans and burns denatured alcohol. Countless variations on the basic design exist. Total weight, including a windscreen/stand, can be less than one ounce (30 g). The design is popular with ultralight backpackers due to its low cost and lighter weight than most commercial stoves. This advantage may be lost on long hiking trips, where a lot of fuel is packed, since alcohol has less energy per weight as some other stove fuels. The basic design dates back more than a century. It consists of a double-wall gas generator, a perforated burner ring, and an inner preheat chamber. A similar design was patented in 1904 by New York coppersmith J. Heinrichs. Trangia has been selling a commercial version of the design since 1925, and Safesport marketed a stainless-steel stove in the 1990s. The Trangia stove burner is made from brass, although all the other associated parts that come with it are aluminium. A plastic bag is provided for the burner, so that when packed away the two dissimilar metals do not corrode. In the unpressurized open-top design the double wall acts as a gas generator, transferring heat from the flame to the fuel. This effect enhances combustion, producing more heat than other passive designs. The inner wall also creates a convenient preheat chamber for starting the stove. Once the fuel has warmed up, its vapor will travel up the hollow wall, pass through the perforations, and form a ring of flame. This improves air/fuel mixing and therefore combustion. Vapor also rises from the center of the stove, but will pass through the ring of flame for efficient combustion as long as a pot is over the stove. Other pressurized designs aim for efficient combustion through closing the fuel chamber after filling, or by filling through the gas-jet holes. A wick may be inserted into the hollow wall, where it will draw fuel upwards closer to the hot parts of the burner. Evaporating fuel from the wick removes heat from the top parts of the burner and subsequently the fuel at the bottom receives less heat. This slows down evaporation through the center while increasing the gas pressure inside the wall, spreading the ring of flame outwards while the center of the burner produces almost no flame, leading to a more controlled burn and faster starting. Suitable wick materials include fiberglass or cotton cloth. The wick will not burn because the evaporating fuel keeps it cool, and the pressure inside prevents air from entering the hollow until the burner can no longer produce enough gas to support a flame. The stove is made from two aluminium can bottoms. An inner wall is cut and rolled from the can material. A ring of holes is pierced into the top with a pin. Parts are glued with high-temperature epoxy, or sealed with thermal foil tape, although this is not strictly necessary. Total height is less than two inches (50 mm), though dimensions may be increased to hold more fuel or decreased to take up even less space. The choice of aluminium has several advantages—light weight, low cost, and good thermal conductivity to aid vaporization of fuel. Alternative construction materials have been used, including stoves made of tin cans such as cat food tins, tuna cans, and juice cans—the basic design is very similar. Windscreens/stands can be fabricated from tin cans, cut to size with ventilation holes added. Each stove is designed for one or two people. When used to cook larger meals (greater than 2 cups (0.5 litres)), it is less efficient than a more-powerful stove which delivers more heat to a pot. This is because a longer cooking time is required, during which more heat is lost to the surroundings. A more powerful, pressurized version is shown below. Other attributes of the beverage-can stove are its nearly silent operation and its suitability as an emergency backup. Denatured alcohol is a (relatively) environmentally-friendly fuel that does not leave a residue of soot, although it is toxic to drink. (Pure ethanol is rarely used as stove fuel in the United States, since it is usually subject to a liquor tax.) Denatured alcohol is commonly available at camping outfitters and hardware stores. These stoves operate marginally on 90% isopropyl alcohol, poorly on 70% and not at all with 50%. Water typically can not be boiled with isopropyl. Unsealed alcohol stoves are inherently dangerous, since spilling is possible and the fuel burns with a nearly invisible flame. Trangia offers an anti-flashback fuel bottle with an auto-shut-off pourer. If a spill occurs the best course of action is to step back and let the alcohol burn up. The Boy Scouts of America now prohibits "equipment that is handcrafted, homemade, modified, or installed beyond the manufacturer’s stated design limitations or use. Examples include alcohol-burning 'can' stoves, smudge pots, improperly installed heaters, and propane burners with their regulators removed." ^ http://www.scouting.org/filestore/pdf/680-013WB.pdf BSA Policy on Use of Chemical Fuels. Accessed January 22, 2011. This page was last modified on 14 October 2011 at 03:55.